Last Friday, Mickey Mouse officially celebrated his 83rd birthday (Happy Birthday, big guy!). To mark the event, Storyboad, the Walt Disney Family Museum's blog, posted a terrific story about the evolution of Mickey's birthday through the years--it wasn't always celebrated on November 18. The article was written by historian Jim Korkis, who's excellent book The Vault of Walt is a must-read for any Disney enthusiast. 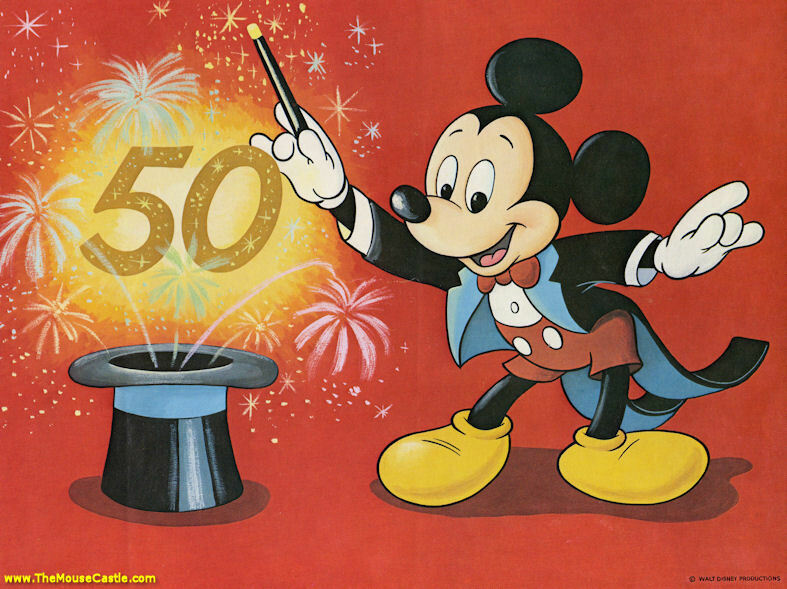 The article inspired me to rummage through my own Walt Vault (not as extensive as most, but I have a few odds and ends) and pull out memorabilia from Mickey's 40th, 50th and 60th birthdays. 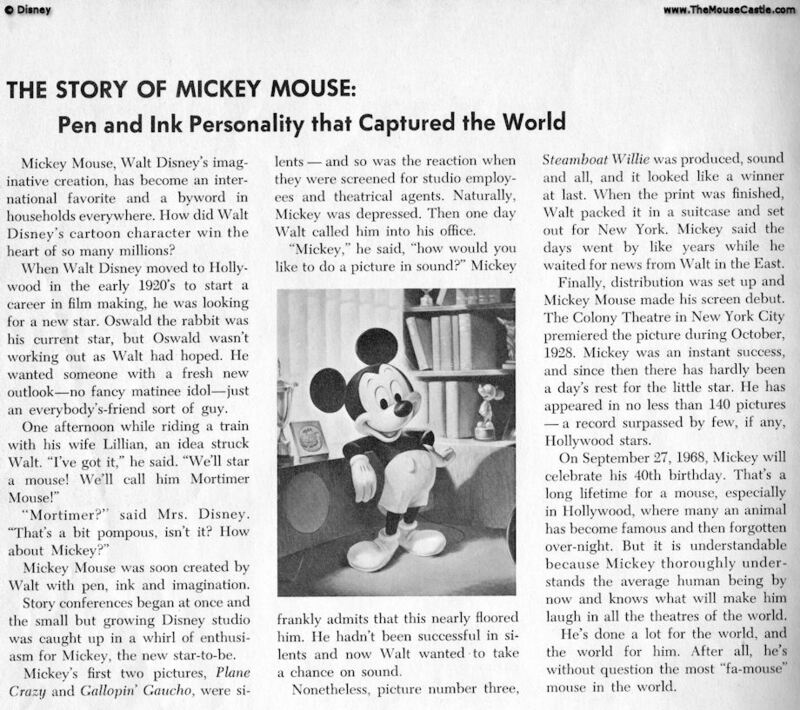 I was pleased to discover that an article I have about Mickey's 40th from the Summer 1968 issue of Disney News actually disagrees with Mr. Korkis's story. 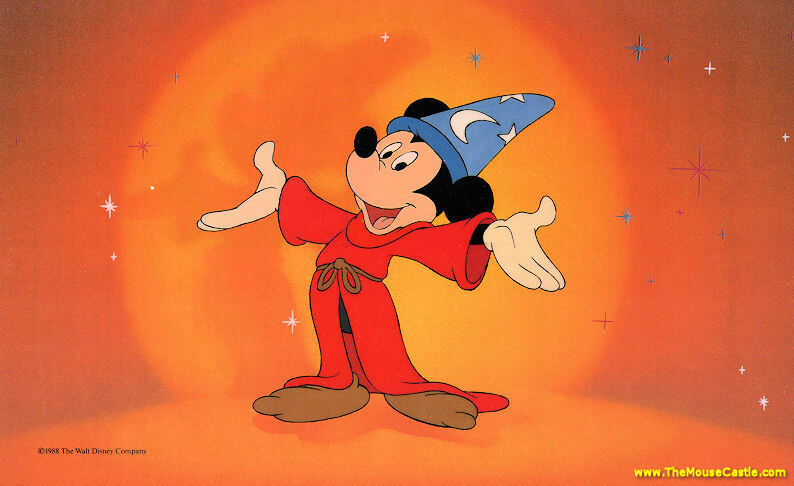 He indicates that Mickey's 40th birthday was observed on October 28, 1968. According to Disney News, it was celebrated on September 27. Disney News (click to enlarge). I'm not playing a "gotcha" game here. Jim Korkis is a respected historian and does his homework. What I find fascinating, though, is that among all the wealth of Disney history, news and minutiae out there, it's quite common to come across contradictory items like this. That's the joy of delving into Disney history, sorting out what's right. My first reaction to discovering these different dates was, "I wanna see Korkis's source. He has something I don't." Undisputed is the date of Mickey's 50th birthday, November 18, 1978. I know this for a fact because I was there--well, at the Walt Disney World version of the celebration anyway. 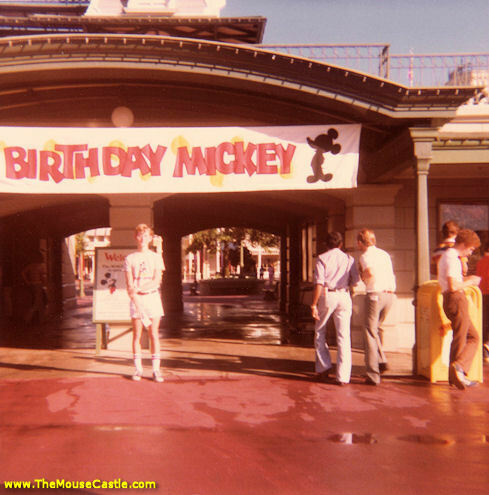 Mickey Mouse's 50th birthday, November 18, 1978. That's me on the left with the bony legs. All the visitors to the Magic Kingdom that day received a commemorative lithograph. 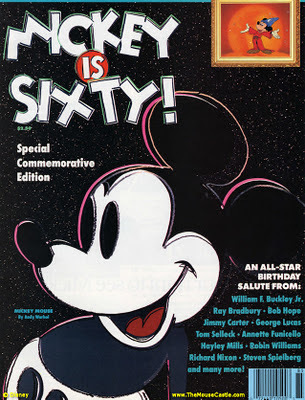 My favorite piece of Mickey birthday memorabilia is the Mickey is 60! special edition magazine Time Magazine released in 1988. Included in its 64 pages were historical tributes written by Richard Schickel, Leonard Maltin, John Canemaker, Bob Thomas and other noted authors and historians. There were comments by dozens of celebrities ranging from Annette Funicello to George Lucas to Bob Hope to Pee-wee Herman. Also inside was a Sorcerer's Apprentice sericel, "suitable for framing." Who really frames and hangs these things? Tear it out and destroy the magazine? Don't let's be silly! My sericel remains on page 17 where it belongs. Jim Korkis here. I LOVE getting corrections and additions because unfortunately so much of Disney history hasn't been documented by the Disney Company. 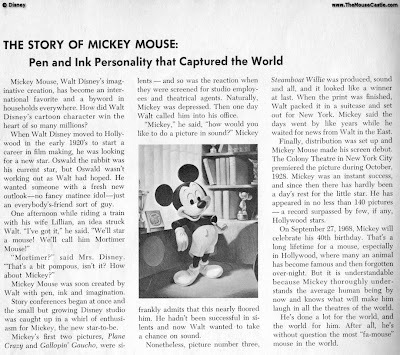 My source was a press release and an article by Jim Fanning, who is a Disney historian who also does his homework. Great seeing this DISNEY NEWS piece that contradicts my information. It is important to get the accurate stuff in print so it is back to the vault for me to look harder! Thanks for the kind words as well. Thanks also for the plug for my book! Thanks Jim! It's great to hear from you! Please let me know if you dig up any other information. My mom actually framed and hung the sericel up in my bedroom, where it remains to this day.